The other day, a friend came into the studio with some cacti leaves. So I asked her if i could photograph them. This is what came out of it. There is a mix of standard lens and a new lens I was trying out that day - the lomo achromat lens -64mm an art lens. A little over a year ago my father passed away. A scientist and passionate environmentalist. These flowers were from his wreath. I wanted a way to commemorate his passing and have something to remember him by that can be shared. What can I say, but what a challenge! There are very few videos or tutorials on the use of manufactured dappled light. What I mean by this is the effect created using strobes, by placing a patterned object in front of the light to create the effect of light filtering through trees. Something that is nice to use with food photography, but as I tend to shoot mostly with strobe rather than natural light- lets just say it's an experiment in progress. I saw one guy use acetate sheets with patterns printed on them, placed on the softbox - which you can buy, at a cost, but most likely not available here in Australia, and not cheap. Another used laser cut mdf, which i think is custom made, but he places it close to the subject. Nice, but unless you have huge budgets, this is not that practical. Of course there is great old diy cut out cardboard... you can make any pattern you want, or the laserlight option, which you place on your flash head and it projects patterns on your subject. So, in my search I have experimented with the acetate option. I found cutout foam stickers from one of those recycle centres that sell craft supplies to schools and artists from industry waste. I even found acetate sheets there! I also tried black paper cutout option, cutting out leaf shapes in all shapes and sizes to create the effect of leaves on a tree. I also tried these plastic dish racks from Daiso that had a flower pattern in them - which was essentially a flat piece of plastic with flower shaped holes in them - very cute, but obviously can only be used on small subject. You could use screens of sorts- like from a garden centre, or die cut metal would be pretty, or peg board can be effective for certain styles of shots. The main thing is experimenting with the distance of the 'screen' to the subject as opposed to the light source. I found that having the screen closer to the subject works better, and not diffusing the light too much. 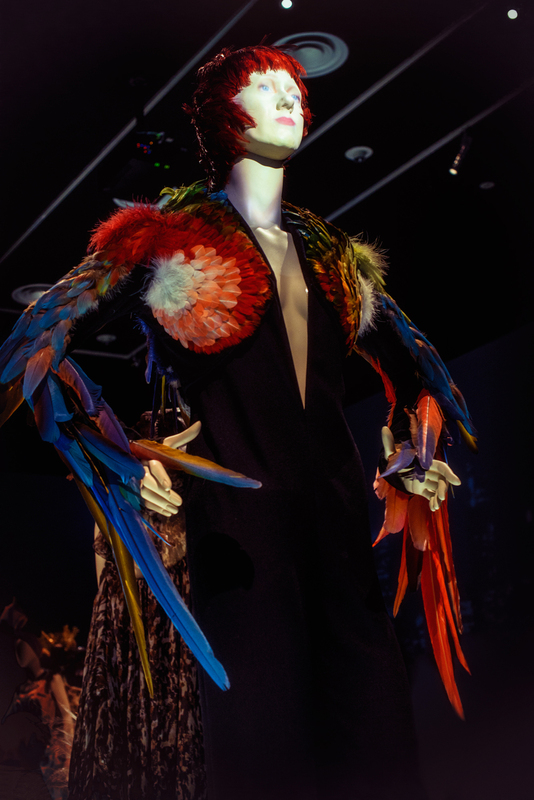 Managed to catch the Jean Paul Gaultier exhibit at the NGV International. What a show! So much versatility and creativity from one man!... well, I guess he has a team to create his visions, but anyway... blew me away! I come from a background of fine art and dabbled in fashion too, so I really appreciated his references to history and culture, and his fearlessness too. Anyway, here are some of my favourites... a test for my low-light / hand held abilities! I recently had the pleasure of visiting the Alowyn Gardens in Yarra Glen, Victoria- about an hour outside of Melbourne. I have to say, it was pretty inspiring, and hope to return when different flowers are in season. A great location for Wedding or Fashion Photography, the gardens are sectioned off into different types of gardens including edible, sunflower, poppy, perennial borders and hedge gardens, with the most awesome wisteria archway (which was not in season on my visit), tree groves etc. A series of photographs documenting the intricacies and beauty of doilies. Initially I was going to use them as stencils for my bags, but in photographing them, realised they make interesting subjects. Rob is a talented Illustrator/Painter/Designer. We kind of had an impromptu photo session & this is the result…. Photo projects on the fly and inspiration around me.